Temporary pools are one of the most abundant types of aquatic habitats worldwide; however, they are also one of the most threatened and least studied. Unlike many lakes and streams, temporary pools only hold water for part of the year, ranging from a couple of weeks to many months. During the dry season, these habitats often go unnoticed to the untrained eye, making them more vulnerable to anthropogenic disturbances and less likely to be viewed as valuable habitats. Temporary pools, while short-lived, are important sources of water across many landscapes and are used by a variety of species such as aquatic plants, large mammals, amphibians, waterfowl, and many invertebrates. Some animals have even evolved special mechanisms and behaviors to persist through the dry periods (i.e. desiccation-resistant eggs, dormant life stages, burrowing etc. ), allowing them to maintain relatively permanent populations in what are seemingly impermanent environments. A particular group of crustaceans known as branchiopods, which consists of fairy shrimp, tadpole shrimp, clam shrimp, and waterfleas, are uniquely adapted to life in temporary pools and are iconic of temporary pool ecosystems. They produce desiccation-resistant eggs that remain dormant in the pool’s sediment waiting for the pool to refill with water. Once they hatch, they can undergo a complete life cycle within a few weeks before the pool dries again. Branchiopod species are also very sensitive to changes in water quality, so the species you find within a temporary pool can be very informative of that pool’s environmental characteristics. One of the primary challenges with studying temporary pools is that their physical, chemical and biological characteristics are dependent upon geographical characteristics such as geology, topography, and climate. Therefore, temporary pools from different regions will often have their own suite of unique characteristics and support distinct plant and animal communities. The temporary pools of many regions have not been adequately studied. 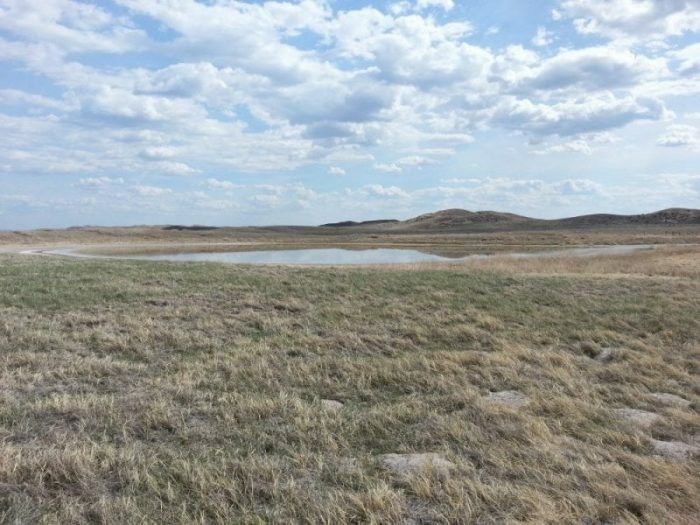 The Nebraska Sandhills covers approximately one-third of the state of Nebraska (~50,000 km2) and is home to thousands of freshwater and saline-alkaline lakes and temporary pools. The permeable dune substrate allows rainwater to pass through the dunes and into the underlying water table, which discharges water into the dune basins, forming thousands of aquatic habitats ranging from small temporary pools to large lakes. The lakes are chemically diverse, ranging from freshwater to hyper-saline/alkaline. The majority of the saline lakes are located in the semi-arid western Sandhills, where a combination of high evaporation rates and a lack of surface water drainage have led to gradual increases in salinity. The abundance of saline lakes, as well as lake salinity, declines eastwards as precipitation increases. The high abundance of environmentally diverse aquatic habitats make this region an ideal natural laboratory from which to study ecological processes; however, the majority of the research in this region has focused on the lakes, and very little is known about the smaller, ephemeral aquatic habitats, the temporary pools. 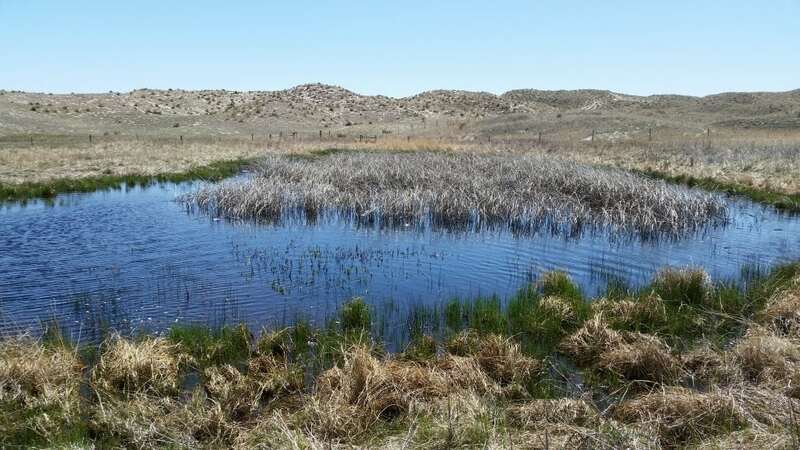 In a recent study published in Inland Waters, we conducted a survey of temporary pools across the Nebraska Sandhills region to increase the knowledge of the environmental and biological characteristics of these poorly understood habitats. We were particularly interested in how these characteristics were associated with the longitudinal climate gradient that overlays the region, so we sampled temporary pools in the eastern, central, and western Sandhills. The relative abundance of saline temporary pools and the salinity of those pools increased westwards as the climate became more arid, which is the same pattern that has been observed with Sandhills lakes. The salinity levels of the pools had a strong effect on the species we found in them with fewer species found at higher salinities. Therefore, western saline temporary pools typically contained fewer species, simply because they were more saline. However, we also found that the number of species in the freshwater pools decreased westwards even though the western freshwater pools were environmentally similar to the eastern freshwater pools. We suspect that this westward decline in species may be due to the westward decline of suitable habitat. While many species can tolerate low salinity levels, very few actually benefit from living in saline environments. As the proportion of saline pools increases westwards fewer species can utilize those habitats. We found that the average number of species found in both freshwater and saline temporary pools, as well as the overall number of species found in each study area, decreased from east to west as the saline pools became more abundant and freshwater pools became rarer. We are continuing to study this phenomenon by conducting additional field research and laboratory mesocosm experiments to determine how the abundance of particular habitat types can influence the biodiversity of temporary pools and of the entire landscape. We are particularly interested in how the condition of one habitat can influence the species we find at neighboring habitats. 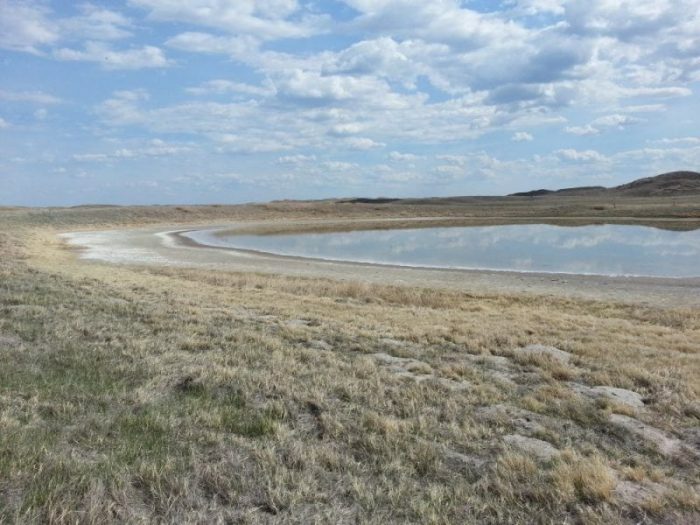 The Nebraska Sandhills system serves as an excellent warning as to what can happen to the biodiversity of aquatic ecosystems that are influenced by salinization. Salinization has become a global issue with many freshwater ecosystems becoming more saline each year. The results from our study indicate that as more freshwater ecosystems become saline, we should expect to see a decline in freshwater biodiversity even in non-impacted neighboring habitats. This study, Trends in temporary pool water chemistry and branchiopod communities along a longitudinal climate gradient in the Nebraska Sandhills, was recently published in the journal Inland Waters.